Wellington and its near surroundings are set to grow with three big housing developments in the pipeline. Whatever we feel about this, we must strive to make them more than just faceless housing estates. 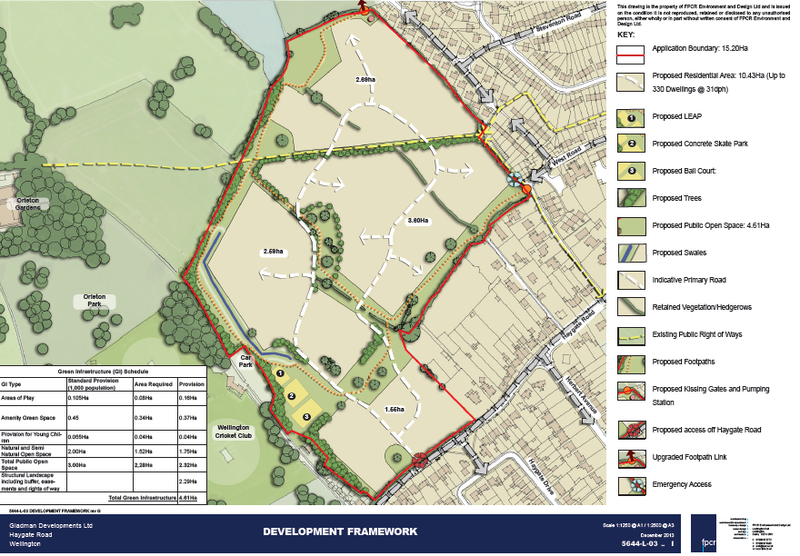 Earlier in the year, permission was granted for a total of more than 400 homes on two neighbouring sites either side of Wellington Cricket Club, in the south-west corner of the town. The most contentious of the two, on Haygate Road, will see 330 homes built, whilst just across the junction with Holyhead Road will be 77 homes plus an extra care facility. 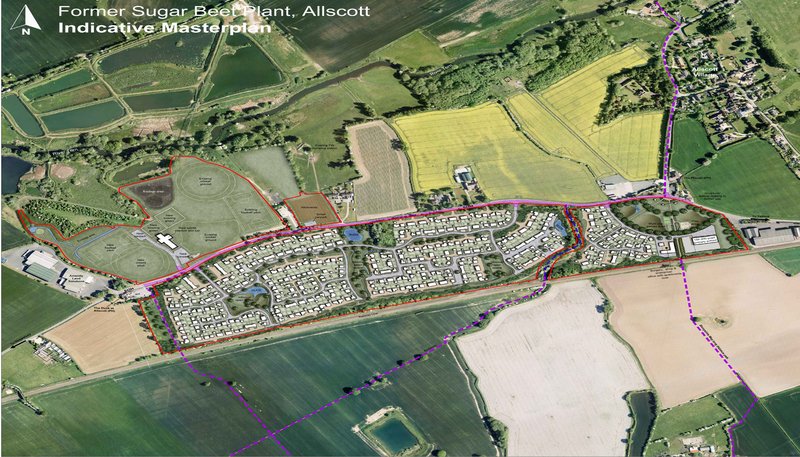 Three miles west of the town at Allscott, 470 were granted permission on the site of the former Sugar Beet Factory. 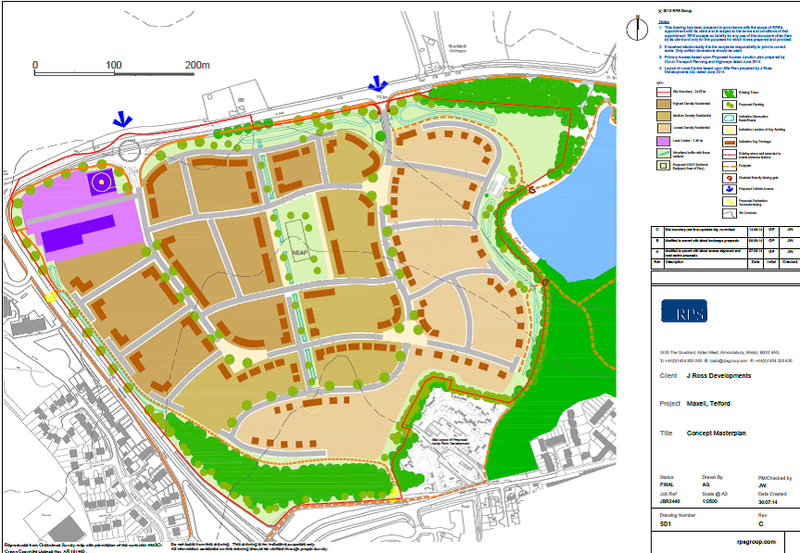 And not yet decided but very likely to go ahead in some form is a plan for 600 houses around the old Maxell site at Apley to the north-east. If you haven’t seen the site plans for these upcoming developments, take a look below. They’re not what you’d call detailed, but they give you a broad idea of the shape and scale of what’s been agreed – and in the case of Apley, what’s being proposed. All these plans / proposals have been presented as outline applications – that means they provide an overall framework for the development, but that the details (such as precise layout and designs) are yet to be determined. Big developments like these naturally attract a lot more objections that smaller ones – the Haygate site was strongly opposed by residents, and the council’s planning portal shows a long list of objections accumulating at Apley as well. These sorts of big developments can create opportunities, however – such as the opportunity to plan for and create new services and facilities as well as houses; and the opportunity to thoughtfully design a whole neighbourhood, rather than just cramming in extra houses in spare nooks and crannies. But the big question is – will these opportunities be realised? Will we seize on the rare opportunity to master-plan entire new neighbourhoods which are interesting and beautiful and which add to their surroundings, or will we allow more bland housing estates to rise up from the earth? Will we extract sufficient developer contributions to fund the community space, road improvements and environmental improvements we should expect, or will warm words in planning applications in the end offer cold comfort? Too often, the process by which we arrive at these landscape-changing developments feels broken. Developers submit plans, locals understandably oppose them, the council agrees the application (unless it has strong reasons not to), the residents are angry and despondent, and the developer gets to work fine tuning the detail ready for building. This is not a healthy way to build attractive, interesting, loveable communities. Sadly, the planning system isn’t wired to generate positive community engagement in design, or to inject creativity and inventiveness into the process of shaping new development. So, once the dust settles on an unsuccessful fight against a development, residents and their town / parish councils need to do more than shrug their shoulders – they need to stay in the game and collaborate with developers on the details of what’s to come. What’s more, developers of big sites like these should be obliged to undertake those processes. The huge development of Lawley, a few miles up the road, appears to have been big enough to warrant some thoughtful approaches to design, including design workshops with local people. The result is some interesting and unusual design schemes which set Lawley apart from the vast majority of new estates, achieving high densities (a lot of the units are semi-detached) whilst building in character and distinctiveness. As I’ve said in previous articles, that considered, creative approach which involves local people along the way has to be integrated into the planning for other schemes in the area. Sending a developer’s agent to a community centre with a set of glossy boards telling you how wonderful it’s all going to be – and allowing him to get his ear bent by disgruntled locals for an evening – is NOT a creative, collaborative engagement process. Haygate Park (I bet that’s what they’ll call it! ): this scheme will extend Wellington into open countryside, but once complete should connect up seamlessly with a long-established suburban wing of the town. So, let’s avoid the obvious villagey look and let’s embrace something more recognisably suburban. After all, a century since sturdy redbrick dwellings crept out along the Haygate and Holyhead Roads, and 80 years since mock-Tudor metroland carpeted the fields inbetween, this part of Wellington has a strong pedigree of suburbia. So – build a Lawley-style pseudo village here on the back of Haygate Road and it’ll stick out like a saw thumb. But build something that resonates with its leafy, neatly pruned 20th century neighbours and you’ve got something that’s more likely to fit. The Sugar Beet Factory: Of all the developments, this is the one I’m most positive about. Firstly, it will replace a disused industrial site without straying much beyond the factory’s footprint, so when it comes to the universal preference for building on brownfield land, it doesn’t get much better than this. Secondly, it proposes quite a lot more than just housing – business units, a primary school, a surgery, green corridors and a decent sized park, as well as sports pitches and a new pavilion across the road – augmenting the old sports club’s existing facilities. Add these features to the fact that it will be bookended by two historic pubs, and you’ve got something which could really start to feel like a village in its own right – in fact I reckon it needs it’s own name, maybe something like Allscott Green. Bearing in mind that ‘Old Allscott’ next door is the higgledy-piggledy result of several centuries’ incremental development, the challenge for Allscott Green will be how NOT to feel just like a standard Shawbirch of Priorslee-style housing estate. It won’t be able to shy away from the fact it’ll be a brand new, volume development, but it DOES need to find ways to root itself in its rural surroundings and looking like a village. The Maxell Site: I’m sure it suits the developer to refer to this as the Maxell site, as it emphases the fact it’s a brownfield site, but there’s going to be an awful lot of turf going under the digger as well on this site. Building here makes sense, but the scale – 600 homes, even greater than the 550 outlined in the council’s recent Shaping Places document – comes across as greedy. Anyway, assuming it goes ahead, how should THIS development look and feel compared to the others? Well, it won’t be surrounded by open fields like ‘Allscott Green’, so we shouldn’t conceive of this as a modern village, and it won’t be augmenting an edge-of-town suburb as ‘Haygate Park’ will do. The context here is slightly different – existing Apley housing to the south, near the woods, and to the east beyond the pool will now appear as the leafy, low-density fringes of a large ‘central Apley’ framed by the Queensway and Whitchurch Road. With the most obvious names already taken – Apley Castle, Apley Park, Apley Gardens – maybe the developers will go for something solid and respectable like ‘Apley Square’. Here at ‘Apley Square’, we should look to something like the Lawley scheme as a good template – something which allows for high densities but executed in such a variety and a detail as to forge some sense of character. It will also create an opportunity to overcome Apley’s current weak spot – that it’s all about houses with none of the additions That’s not to say the locals don’t have a sense of community or fellowship – they may well do (not least that forged by opposition to more housing development) but so far they haven’t been afforded many facilities for actually getting together as a community. So yes, I hope that developers are encouraged to reduce the sheer volume of houses on this site, but I also hope they do give the whole Apley area some of those things it’s always lacked – those tangible, physical spaces that make a place whole – i.e. a shop, a pub, a community hall. Apley as a low density executive dormitory perhaps hasn’t missed these things in the past, but Apley as a big new neighbourhood would be short changed without them. And finally, with all these new developments, let’s be creative. Before the builders arrive on site, we have a time-limited opportunity to design in some little extras to make these housing developments look and feel different to the bog-standard ordinary. At Apley Square, let’s set out a cycle route that encourages these thousands of new residents to cycle up the road into Wellington. At Haygate Park, let’s plant wildflowers in the verges and build neat picket fences in different colours. And at Allscott Green, where allotments are already factored into the scheme, let’s riff on that growing theme and make this an edible village, with orchards in the green corridors, herbs in the verges and bee hives on the school roof. Those are just my ideas, but what does everyone else think? And how can they get round the table with developers to ensure that we don’t just witness the construction of vast new housing estates in the years ahead, but that we genuinely shape happy, cohesive communities in the process. Very constructive comments. You had an excellent outcome with this approach when the new civic buildings were being designed. I wonder how many people affected by the Haygate proposals will see this article and be inspired? I think there is a good case to be made for printing this article and distributing it to households in the area. I would be happy to do this if you think it is a useful idea. Thanks for the comment, Rob. We did get some success with the design of the civic buildings, yes – perhaps that was easier because we were dealing with council, who had an interest in keeping local people on board with the proposals. Developers might be harder to engage, but if residents come forward with friendly, reasonable requests to get round the table – along with some experienced design input – and co-create the masterplan for housing in their area, even developers should be willing to participate. On the point about Haygate residents – I’m not sure if they’re still too angry about the planning decision, but I do really hope they stay interested and have some involvement in shaping what ends up on that site. I’d be perfectly happy for them to see a copy of this article if you think it would get some wheels turning! Maybe sharing the link on their Haygate Fields website / facebook page would be easier than printed copies to households?